Their motto is “for the love of bread and friendship”. Need we say more? Probably not but we will anyway. 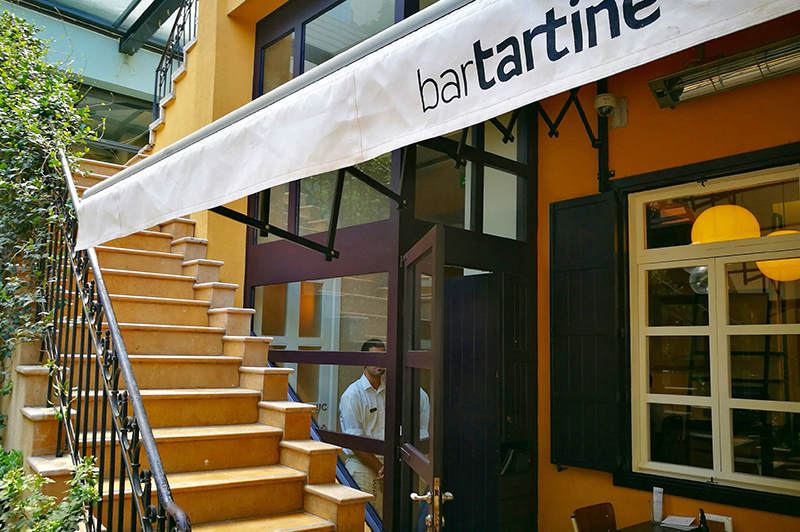 Bar Tartine first opened a stand-alone bakery in the Mar Mikhael courtyard. Their freshly baked bread and pastries are unquestionably one of the best in town. Choose from their croissants, pain aux olives or plain French baguettes and you’ll leave satisfied. You also cannot go wrong with their chocolate moelleux (a sponge-like chocolate cake with just the right balance of sweetness and moistness). Shortly after, the restaurant, nestled in the courtyard away from the hustle and bustle of the main street, welcomed its first customers. Almost instantly, Bar Tartine became a go-to destination. Its charming al fresco dining experience coupled with its healthy rich Mediterranean menu will have you thinking you just may be lunching in Ravello, Italy. The colorful yellow house, the trees surrounding the tables, the sun permeating what can only be described as a little village of happy diners, are only some of the elements that make Bar Tartine a unique place. Though their service can be slow on busy days, the food more than makes up for the occasional delay. A variety of sandwiches, salads, artisan pizzas and burgers are served by eager-to-please staff. The lean and mean burger with melted Camembert and the seared tuna wasabi sandwich are a must try.